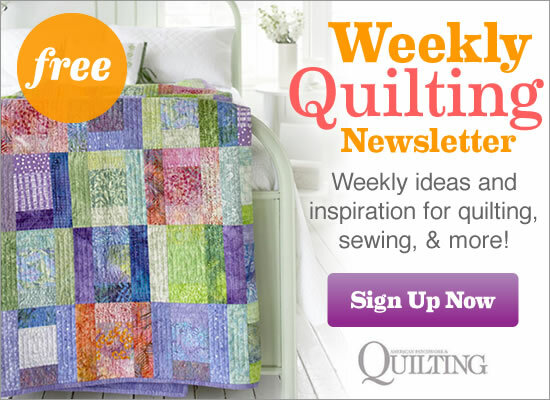 See the featured quilts and web-exclusive color options and projects from the American Patchwork & Quilting June 2016 issue. 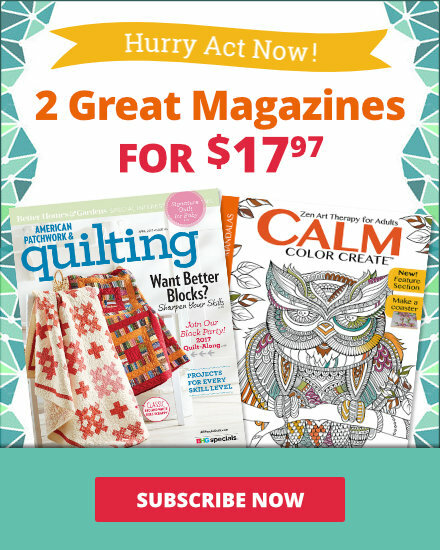 The June 2016 issue of American Patchwork & Quilting is on sale from April 4--June 7. 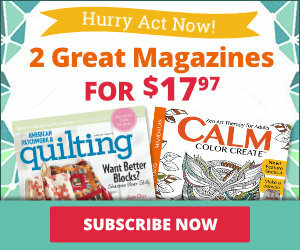 In each 2016 issue you’ll get instructions for one row. At the end of the year you can put the rows together to make a throw. 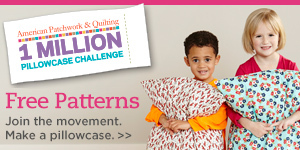 Join us on Instagram and Facebook to see what others are sewing with hashtag #APQrowquilt. 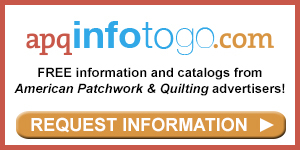 Get more info about the Row Quilt here. Most fabrics are from the Little Miss Sunshine collection by Lella Boutique for Moda Fabrics. Fusible appliqué and simple piecing result in a cool, refreshing quilt. Sew a wall hanging with sections featuring favorite summer motifs — a bowl of lemons, blooming flowers, and sunny pinwheels. Appliqué fruit and straws to pieced glasses of refreshing drinks for a summertime table topper. Add an authentic period feel with poison green setting pieces and an arrangement that displays basket blocks to their best advantage. Combine bright yellows and pretty florals for a cheerful springtime wall hanging. Solid white block backgrounds let the baskets shine. To create this Civil War reproduction version of True to Tradition, quilt tester Laura Boehnke made black baskets with blue accents and blue baskets with black accents. The red print she used for the 1"-wide inner border reinforces the red triangle in the center of each basket. Rich reds, blues, blacks, and creams in petite florals, period geometrics, and small prints look right at home in this traditional wall hanging. Simple prints in many colors circle around on a neutral ground. Big blocks make the throw-size quilt quick to construct. For her three-block version of The Wheel Deal, quilt tester Laura Boehnke used prints in a traditional cream, blue, and brown palette. She pulled in a skinny rust border to help the reds in the prints come alive and used a greige background to warm up the table runner. Editor Jill Abeloe Mead’s version of The Wheel Deal is a visual treat. Prints with polka dots in a variety of sizes and densities keep your eyes moving around the circles and a scrappy low-volume background made from gray prints adds texture. Black and ivory fabrics provide a neutral base for red pinwheels, which immediately grab your attention. The facets of the foundation-pieced blocks form a multitude of secondary designs. Lime green triangles stand out against tans, browns, and creams. Four come together in the quilt center to form a spinning pinwheel. Small prints and near solids provide visual texture but let the eye focus on the form rather than the fabrics. The colors in quilt tester Laura Boehnke’s wall hanging, aren’t true primary colors—the yellow has a bit of orange and the reds are rosy—but the near-primary color scheme still has a lot of zing. Appliquéd starfish swim in a pieced batik sea. Brush up on your rotary-cutting skills to create an angular border. Combine dark shades of several reproduction fabrics for a low contrast quilt center. Then punch up the contrast with a standout zigzag border that frames the center. For her second version of Sea Stars, quilt tester Laura Boehnke dialed up the intensity, using mostly violet-blue and orange batiks. The pure colors give the wall hanging a tropical feeling, which is perfect for the starfish appliqués. This big-block quilt celebrates stars and circles, both pieced and appliquéd. Quilt tester Laura Boehnke’s version of Give It a Whirl plays up the subtle color variances in batiks to create a calming quilt with flowing movement. A tan background in two blocks and the skinny inner border bring the quilt center to the forefront. Laura appliquéd the star centers for an easier way to assemble this block. Most fabrics are from the Garden Rendezvous collection by Ro Gregg and the Happy collection, both from Paintbrush Studio. In her Give It a Whirl variation, editor Elizabeth Beese experimented with saturation in the sunburst blocks. She made the star points more vivid than the backgrounds, giving each block a pleasing pop of color. She chose a large-scale print for the setting squares to tie the colors together and offset the tone-on-tones used in the sunburst blocks. Designer: Vanessa Christenson of V & Co. Looking for a quick pick-me-up for your decor? Easily embellish a pillow with gathered fabric roses. An ombré fabric gives the flowers depth. Neutral fabrics with plenty of visual texture star in editor Elizabeth Beese’s version of Frill Seeker. Large and medium florals and small geometrics provide variation in scale. After considering solids for the fabric roses, Elizabeth used prints and a stripe instead, adding even more variety to her pillow. Pair the quilt recipient’s favorite color with tons of T-shirts in a design that has spaces to feature motifs big and small. Kaffe Fassett has long been known for his bold use of color. Two of his larger-than-life florals form the intriguing color scheme in one of quilt tester Laura Boehnke’s versions of Fit to a Tee, where she replaced T-shirts with the large florals and two additional prints. Laura picked up on the purple and red accents in the florals and used them in the sashing and border. She used a third floral in the strip set that forms the sashing, causing a blending of sections rather than the sharply defined units of the T-shirt quilt. Who says a beach-inspired quilt has to be blue and tan? The starfish, beach glass, and seashell prints in this wall hanging inspire a beach vibe despite the nontraditional color scheme. This kaleidoscopic table runner can be made in myriad colorways. For color inspiration, think seasonally: spring daffodils pushing out of the ground, summer’s fat buzzing bumblebees, or swirling fall leaves. In her version of Focal Point, quilt tester Laura Boehnke went for cool colors: icy blue, navy, and green. The watercolorlike prints make the rings formed in the quilt center look soft along the edges. For her version of Focal Point, quilt tester Laura Boehnke warmed things up with spicy red, magenta, orange, and yellow. The cool green color provides a refreshing break from the heat of the warm hues.